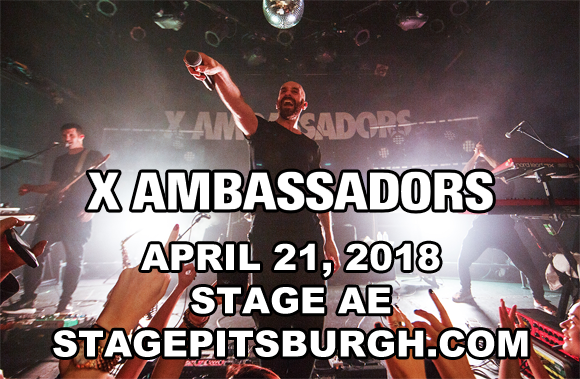 Platinum-selling rock outfit X Ambassadors comes to Stage AE on Saturday 21st April 2018 as part of the Joyful Tour! Supporting the release of their eagerly awaited new album, Joyful, the band are embarking on a spring tour, bringing their hot new tracks to fans across North America, as well as fan favorites like "Unsteady" and "Renegades"! Best known for their singles "Jungle", "Renegades", and "Unsteady", X Ambassadors are an American rock band from Ithaca, New York. Originally known as Ambassadors, the group released its major label EP Love Songs Drug Songs in 2013, and began to gain a following after tours with Imagine Dragons, Jimmy Eat World, The Mowglis and Panic! At the Disco throughout 2013 and 2014. The band released its debut major-label LP, VHS, in 2015. The band's latest release and third studio album, Joyful, is expected in 2018.